From that simple question, the idea for this study was born. We asked female graphic designers from around the world to Photoshop a female form by making her, in their opinion, more attractive to other citizens of their country. The resulting submissions are intriguing. Given the wide range of body sizes submitted, we wondered what these women might actually weigh in the real world. We ran a brief survey with a 35-person sample and, assuming a height of 165 centimeters, asked participants to guess the weight of the woman in each Photoshopped image. We then calculated her BMI based on average weight data. 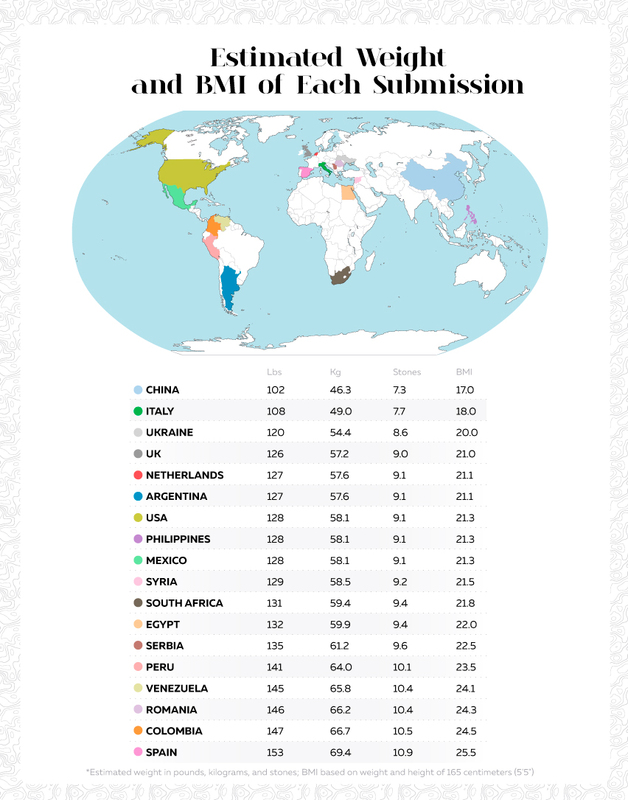 China and Italy had the thinnest submissions, weighing in at an estimated 7.28 and 7.71 stones respectively. Spain had the heaviest submission at 10.93 stones, while China had the lightest (7.28 stones), which translates to an estimated BMI of 17. As noted above, according to the NHS, this qualifies as anorexic. Superdrug Online Doctors commissioned us (Fractl) to investigate perceptions of beauty around the world. We focused on female designers, as we wanted a woman’s view of what her culture finds attractive and to understand more about the pressures they face. However, in order to get entries from more countries, we accepted contributions from four men with the caveat that they first seek input from women and base their design changes on this feedback. We used three designers from international locales with whom we were already acquainted, but most of the artists featured were contracted via freelance job boards. We attempted to get as wide a spread as possible across the world, but many countries are poorly represented on these job boards, particularly when it comes to female designers. We also had issues finding interested artists in some countries due to the amount of skin shown on the model. Since what is perceived as beautiful can vary substantially around the world, our study of the ideal body image attempted to compare as diverse opinions as possible. 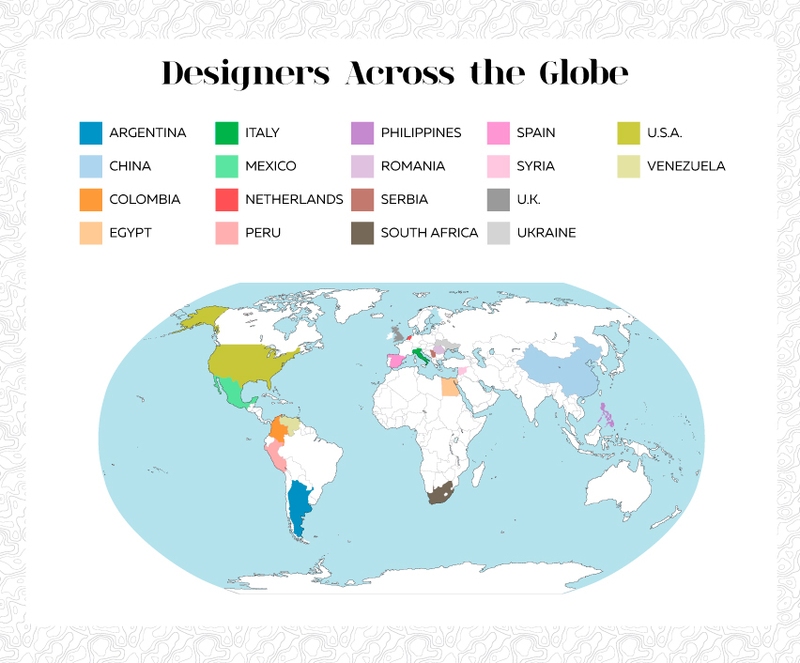 We located designers from 18 nations spanning five continents, including North America, South America, Europe, Africa, and Asia. “Beauty cannot be judged objectively, for what one person finds beautiful or admirable may not appeal to another,” so says the dictionary. And the range of depictions found in our study appears to confirm this notion. While beauty can come in many forms, and we suspect that people will forever chase these assorted ideals of perfection, Superdrug Online Doctor commissioned this study to explore how such ideals vary across borders. If you liked this study but wished we had taken a different angle or perspective, check back as we are planning follow-ups on both male and female beauty. Original image credit: Hugo Felix/Shutterstock.